What is Your Child's Foot Type? Our sports medicine society puts far too little importance on the issue of foot-type. Each and every foot has a unique personality, and can be defined in one of 3 categories; pronator, neutral (normal) or supinator. The running shoe industry has created shoes specifically for each foot type, and it should be part of every young athlete’s examination profile to know what shoe type is appropriate for the best injury prevention program possible. Each foot has 3 arches (Fig. 1). If one or more of these arches have “fallen”, or are not doing their job, there will be a domino-like effect up the entire structure (Fig. 2) producing increased demands on one or more areas of the body (muscle, tendon &/or joint). Secondly, the standing foot type can be different than the dynamic foot type (running), therefore, it’s important for a trained shoe specialist to determine what the dynamic foot type is so that the proper shoes can be recommended. 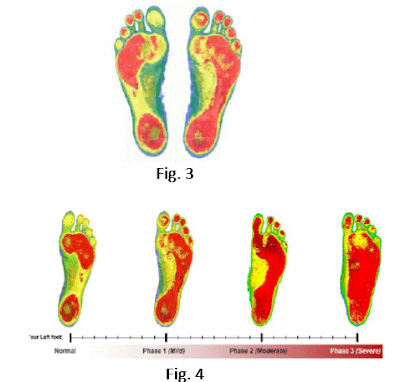 The standing foot type can be determined through digital scanning (Fig. 3) and appropriate recommendations will be made with regard to custom orthotics. As you can see in (Fig. 4), there is a difference between optimal foot support (strong arches) as compared to a foot with one or more weakened arches. In almost all people, there will also be a difference and imbalance between the left and right foot. Standing foot type can be addressed and corrected rather easily. 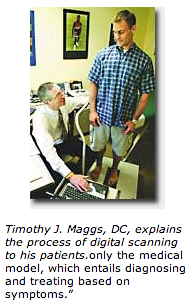 As we can see, there is a tremendous difference in full body alignment once custom orthotics are recommended. There is a mere 2 minute difference between picture one (without orthotics) and picture 2 (with orthotics). Understand the importance of a full biomechanical exam (including foot type) on all athletes, regardless of age. Biomechanical x-rays are recommended for those 12 and older, but custom orthotics are recommended for those 7 and older. Specific shoe types should be considered for all athletes 7 and older, and bring custom orthotics to specialty shoe store when purchasing shoes (running, basketball, soccer, etc.). Well, we've made it to 2015. New opportunities, new "issues". But, that's what keeps the heart beating and the mind active. Best of luck to all, and please keep your sense of humor, because without that, nothing's worth anything. It is possible to “fix” our healthcare system. The laws for good health have been known for hundreds of years. Our broken healthcare system is due to the “business” of healthcare (reactive care), while ignoring much of the science & art of healthcare (proactive care). To fix this system, we must take decisive steps. Each and everyone of us. First, we must take responsibility for ourselves. Quit asking, “Does my health insurance cover this?”. The correct question to ask is, “What must I do to improve my health?”. Secondly, we must “Get Moving”. Motion is the key to improve our health and reduce costs. When we begin regular, controlled motion, we maintain a better weight, we manage our blood pressure, cholesterol, anxieties and more, without the use of drugs. In addition, momentum breeds momentum, and we’ll now have a higher level of motivation to improve our diets, sleep habits and overall attitudes. This will make a huge impact on reducing healthcare costs. Not just a little, but drastically. All while our quality of life improves. Not just a little, but drastically. So, the mission is to get moving and get our kids moving. Adults must show by example that movement is the key to fixing this overwhelming problem. The importance in taking action at this point in time cannot be overstated. Changes for tomorrow must begin with actions today. Only through taking full responsibility to solve this crisis can any of us hope for a better life for future generations. 100% of My Patients Get Custom Orthotics What about Yours? 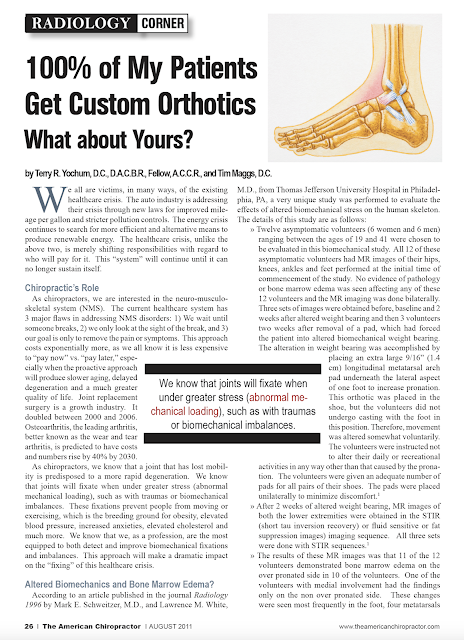 Click here to read this article that was published in the American Chiropractor August 2011. Chiropractic care focused on treating symptoms alone amounts to a waste of time and expense, and represents a disservice to patients. So believes Tim Maggs, DC, a solo practitioner in Schenectady, NY, who is making it his mission to harken the profession back to an embrace of the model it used in the days before chiropractors started patterning their thinking in the fashion of medical physicians and allowing themselves to be pushed around by insurance companies. Both saddened and alarmed by all this, Maggs some years back put into motion a plan to recalibrate the thinking of the profession and the community. The centerpiece of that plan is his development of an approach to chiropractic care he calls Structural Management®. Climbing that pyramid, reaching the apex, patients find—at least in theory—that they have achieved optimal structural performance. In other words, they will have attained truly good health, Maggs suggests. “My message, which I’m taking to sports, to industry, to the general population, and to the chiropractic profession is this: We can’t know what needs to be done for the individual until we first know where we’re starting from,” he says. “The only way we can learn what his or her structural distortions are is to take, if you will, a Structural Fingerprint® of the patient. This has nothing to do with symptoms, but everything to do with the ability to extract structural information to know where that person is relative to normal. The process of Structural Fingerprint®ing begins with the compilation of a thorough health history, followed by an evaluation of the feet. Explaining the findings in a cogent, impact-making manner to the patient is no less crucial because doing so then opens the door to the next step, the treatment phase, and induces in the patient a delightfully high level of compliance. “Let’s say the patient is 42 years old,” Maggs hypothesizes. “Predictably, this person has another 43 to 48 years left on this planet. What’s he going to do to preserve and protect himself when he’s already starting to break down? If you tell the correct story to the patient, using the right terminologies and the simplest presentation, he is going to ask what can be done to preserve and protect himself. Once the patient asks that kind of question, you can correct his entire thinking about health,” shaking him loose of the indoctrination he’s received at the hands of the insurance industry all those years prior. From there, the patient is primed to begin advanced conditioning, Maggs’s term for conventional chiropractic adjustment, rehabilitative exercises, orthotics, and more. His awareness of the problem became particularly acute after spending 4 years working with the New York Giants football team. It occurred to him in the course of that relationship that “almost no one involved in the players’ well-being truly understood the details of their structural needs,” he says. Soon afterward, Maggs began constructing a chiropractic version of that coach’s process. It took a number of years of experimentation and refinement, but eventually Maggs came up with what he is convinced amounts to a winning methodology. Each year, Maggs conducts 25 seminars on Structural Management® to help colleagues learn how to integrate it within their own practices. However, there are some who find converting fully in one giant leap a sometimes impossibly daunting process because of its revolutionary nature, Maggs warns. Stripped of the Structural Management® component, Maggs’s Schenectady practice (50% cash based, 30% insurance, and the remainder a mix of workers’ compensation and the New York state version of personal injury) is pretty much a plain-vanilla operation. His office is relatively small, about 800 sq ft, into which are packed a pair of adjusting rooms, an x-ray suite, and a reception area. However, Maggs has found the somewhat cramped quarters much to his liking. He says a compact facility abets efficiency and, if nothing else, his is an ultraefficient office. Even so, Maggs finds his practice outgrowing its current digs. A move to a larger site appears inevitable. As for marketing, Maggs is no fan of advertising in outlets such as newspapers and phone books. “That type of advertising motivates a response only from those people with a preconceived and completely misinformed notion of what’s going to happen when they visit a chiropractor,” he grouses. Another outlet Maggs has for his message is consumer magazines. Each month, he writes a sports medicine column for about a dozen regional publications catering to runners. Maggs says he plans to continue refining his Structural Management® program and, at the same time, build a national network of doctors trained in its use. “My goal is for every community to one day have someone there who performs structural evaluations,” he says. “The participants in this network will be equipped to educate their communities and motivate them to take action with regard to their personal health. Tim Maggs, DC, is a natural-born optimist. That, however, puts him in the minority, since most people are innately the opposite. Still, in his view, chiropractors not prone to an upbeat outlook can nonetheless learn to adopt that frame of mind. Optimism lies at the heart of a chiropractic methodology for which the Schenectady, NY, practitioner has garnered considerable renown in recent years. Most of that approach to care, called Structural Management®, concerns itself with the health of the body. Now, Maggs is toiling on an extension of it to address the health of the emotions. “We know that we have to exercise to get physically in shape, but hardly anyone really talks about conditioning and strengthening our mental attitudes,” he says. A great way to strengthen the mind while doing the same for the body is the sport of running, suggests Maggs, himself an enthusiast since his youth. But it was in 1976, an Olympics year, that Maggs’s current keen interest in serious amateur running bolted out of the starting block. By 1987, Maggs had competed in 13 major events, including the Boston Marathon. Then, tragedy. A day after his run through historic Beantown, Maggs developed a problem with calf pulls. “For the next 8 years, I couldn’t handle anything longer than a 3-mile run,” he says. His running days were anything but over, though. 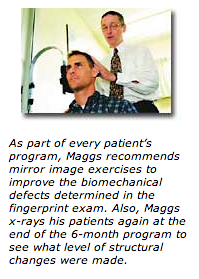 Using a muscle management program he and two other practitioners developed (and which today is a component of his Structural Management® approach to chiropractic), Maggs restored himself to a level of functionality sufficiently high that he was once more able to run marathons. A title such as this is always risky, as a writer can either immediately lose a reader or hook them for the entire section, regardless of the content. The title is an off shoot from the bible- you know, "the last becomes first and first becomes last", or "extreme bad equals good and extreme good equals bad". No matter how you, the reader, looks at it, there is something eccentric in the meaning of the title, and that's the reason you should read this article. Who knows, you may even enjoy it. Around 1990 I wrote and published a book titled Problemology: The Science of Dealing With Problems. The premise of the book was that most people are not equipped emotionally to handle problems when they arise. Most people "hope" problems don't come (which is hardly a fool-proof strategy). When a major problem arises, these people have no game plan to fall back on. All decisions now become emotional in nature, rather than logical and strategized. As always, when your emotions are in the drivers seat, watch out. Anyway, I feel that human beings need to mentally exercise as well as physically exercise to become totally strong (both mental and physical strength). This book teaches mental exercises that allow a person to "prepare" for problems. For example, if you walk out of your house on a rainy Monday morning, late for work, and you see you have a flat tire, the typical response would be to cuss, kick and swear. You'd yell at your spouse, hurt yourself while trying to change the tire, argue with fellow employees all day, etc. Now, for long term wellness, the correct way to handle this would be the following: always identify the problem, (the car has a flat tire), remember that life is an imperfect journey and that misfortunes will always pop up when least expected, correct the problem (change the tire) and thank God that your misfortune on this day was not more catastrophic. The way to get good at developing this mindset is to approach every problem you face, starting right now, with this attitude. Believe me, it takes practice. It's always easier to "react", but as the book explains, far less productive. So now, admitting that life is a rocky journey and our goal is to have the most enjoyable, stress free trip we can have, how on earth does "failure equal victory"?. In our competitive society, we are continuously encouraged to win at all costs and look for immediate gratification. Combining these objectives, you could say we're encouraged to win in the short term. Such as today, not tomorrow. So if you lose today, some may perceive this as failing. Failing, (or perceived failing), like rejection, is more apt to keep people from going after their dreams than even a severe physical disability would in many cases. This is exactly why we need to turn the kaleidoscope of life and view this picture differently. Winning should never be only in the short term, it should be desired in the long term. And the best way to win in the long term is to be willing to fail in the short term. After all, there is no better teacher than experience. While most are taught to hang their heads because of defeat, a more productive response would be to rush home to the drawing board and plan the next strategy. Now you have more information to plug into the computer. You're an expert at what didn't work. This approach, plus persistence is the old tried and true recipe for long term success. Persistence will win. Most people don't have the ability to be persistent due to boredom, distractions or fear of failing. But, long term victory is far superior to short term victory and defeats will always help to teach the necessary tools and techniques to enjoy victory in the long term. In conclusion, life is a continual series of victories and defeats. The mere fact that you breathe means you are a prime candidate to fail at something somewhere along the way. He who can develop the ability "act" instead of "react" will stand a much greater chance of having a smooth and enjoyable trip through life. Winning is simply the ability to smile, care about others, help others, maintain persistence in your goals and keep things in perspective. This is why running is the greatest activity in the world. It simulates real life in so many ways. Even if you're in the Achilles Track Club or wheelchair bound, anyone can relatively improve to feel better about themselves. You can set your own rules to the game. You don't have to win the race, you only have to win your race. Any failure, which is really just a stepping stone to long term victory, is only failure if you quit. As comedian Jim Belushi said in one of his illustrious roles, "Never, never, never lose your sense of humor". Keep running and enjoy every day. After all, just like the marathon, it's only mental! Injuries are inevitable. For any runner who as been at it long enough, becoming injured is only a matter of time. "How can I eliminate the likelihood of injury? ", you ask. There is only one answer that can't fail: "Quit running!" But the desire to run is infectious, and when your running is threatened because of injury, the desire becomes magnified. After all, humans have always had cravings for things they can have, but have been known to kill for those things they can't have. And when running is not in a runner's itinerary, the emotional controversy that takes place rock's the senses. "I've just got to run....". Now, we all know, for every injury out there, there are inner-circle "surgeons general" who quickly and confidently diagnose the condition, outlining the do's and don'ts they'd recommend. From your neighbor to your brother-in-law to your therapist and spouse, everyone's an authority. The runner continues to hear all of these priceless (worthless?) recommendations, but still has to deal with that little voice in the back of the mind screaming to run. "Come on. Don't be a baby. Run through the pain. If it hurts, just stop. What do they know anyways? None of them even run!" Six weeks of mild running (which the runner will tell you was total rest), and the injury is still there. More relatives and fellow employees have joined the list of "specialists" voicing their opinion and the hope for a future on the roads now seems near impossible. But before all hope is gone, STOP and LISTEN! There is a way. There are simple means which will get you back. Just as nature provides guidelines to live by, nature also provides guidelines to heal by. You just have to Follow The Rules! (that little clause in the contract we never see). Now they may sound simple, but the difficult part comes in applying them. Ask yourself clearly - "What is my objective?". The answer, for most, is generally the same and pretty simple. "To get from point A (injured) to point B (able to run safely) as fast and inexpensively as possible". Now, the most common reason runner's fail at the above rule is because they try to answer 2 objectives at once. They want to do as stated above, point A to point B, but they also want to run everyday to not lose their conditioning. "But, I go crazy if I don't run". Don't worry, that's only mental and you'll learn to get over it. Keep in mind, nature usually doesn't give us the opportunity to have two wishes at the same time. If you want two, you usually end up without any. (You can't run comfortably or as much as you want, and you don't heal). This is when you start looking to pay money to that great specialist from afar. Believe me, keep your money. Most injuries are cumulative and no specialist can do any more than you can do, if you are disciplined. At this time, sit down and re-define your goals. You may need to forget the marathon you've been training for. You may need to give up that "favorite" race this year if your body is not healthy. Nature doesn't care about your wants, so don't act totally robotic with your schedule. The only thing that stays the same is that everything is always changing. You may need to change your wish list to be more realistic. Decide what you need to do to get from point A to point B the quickest and most cost effective. Generally, allowing the injured area the necessary time to heal is a good place to start. This doesn't mean minimal running or cross training, this means quality healing time. Again, keep in mind, the more you use an injured area, the longer the healing time takes. It is far wiser to do it right the first time, if your true objective is to get back to running pain free and safely. Ice, heat, massage (The Stick®) , rest, anti-inflammatories (Rehab-Plus), etc. are some of the complements you should use. Understand, this is not supposed to be fun. Runners say, "This isn't what I want to do, I want to run". Hey, dying isn't fun either, but it happens. Show an ounce of discipline and intelligence. Quit whining. Shift your mindset during this period. As long as you pressure yourself mentally, your only setting yourself up to come back too soon. Relax and do something you never have time to do because of your running. Soon enough, you'll be back, so don't drive yourself crazy. The lack of pain and swelling does not mean an injury is totally healed. Read that sentence again. Don't "attack" the first day you feel good. The longer you have had to lay off, the slower your comeback should be. Be willing to come back slowly enough. Write the word "RELAPSE" all around the house and office. Imagine going back to square one and starting over. Remember, do it right the first time. Last but not least, keep in mind that being frustrated, yelling or screaming or even whining or complaining is wasted energy. As I said in the beginning, if you run, you will be injured. Save the theatrics. Immediately alter your mindset and go into the healing mode. Ask yourself, "What do I have to do to get back to running the quickest?". I'll guarantee you the answer does not include kicking the dog or yelling at your spouse. Conserve your energy for something worthwhile and have the discipline to correct the condition. It's really not that big a deal. Now, once you've done the above, and you're still not better, look for the specialist who can help. But don't be weak in your discipline and think that if you pay money you'll get some magical cure. Somewhere along the way, you have to pay the price. These guidelines, hopefully, will keep you from paying double. Good luck. Friendships come and go throughout life and the objective is to keep as many as you can as long as you can. Many friendships disintegrate because the normal human brain is continually measuring the wrong information. We measure actions rather than intent. The actions of other people leaves too much to be judged. Many actions occur because someone doesn't know how to act in a certain situation. Others act improperly as a reaction. No matter what, people's actions sometimes don't fit what their intent. In an effort to better judge who should remain your friend and who should get crossed off the Christmas list, judge a person's intent. The intent is what really matters as the actual actions are merely a disguised version of what a person is feeling, and maybe the exact opposite of what a person is feeling. For example, I remember the Thanksgiving I came home from my annual Turkey Day 10k to my wife who was excited that she baked special pumpkin muffins for me and my friends. She was so excited and I was so thankful that someone on this planet was actually going out of their way to attempt to make me happy. Lo and behold, the muffins never rose, my wife felt like committing suicide, and all we had for breakfast was 1" slabs that were supposed to be muffins. Many would have been ungrateful. Ah... not I. I knew that I didn't have enough people in my life who truly cared about giving to me, so this particular situation didn't register as a negative in any way, but a positive. Here was a situation of someone going out of their way to make my life better, and I could have cared less if they rose or not. I had someone who cared, and that's worth millions. The intent prevailed. The action didn't matter. Next time you don't know whether you should be upset or not, judge the intent. Your job of figuring out whether you should ever talk or not in the future will become much easier. If everyone were willing to put aside their emotional switch in their brain in an effort to gain more knowledge and experience, the 5-minute theory would not be necessary. However, such is not the case. Most people are more concerned with maintaining their image at all costs, thus eliminating many opportunities to learn and earn for the future. When standing in a crowd of "knowledgeable" people who are discussing an intellectual topic (such as the economic swirl in the Greek Islands), and all of a sudden the spotlight is put on you, how do you respond? This theory encourages you to quickly and immediately admit a lack of knowledge and hand the torch off to others who may know more. In many cases, someone put in this position would probably go home and commit suicide because of the humiliation they've just experienced. This theory strongly encourages us to remember, we can't be an expert at everything and people respect those who quickly admit what they know and what they don't know. It is far wiser to admit that you don't know and spend 5-minutes learning new information than it is to fake knowledge and spend the next 3 months humiliated over the fact that you didn't know what they were talking about. Gain confidence in what you do know and don't worry about what you don't know. Be willing to admit it and learn, learn, learn. Five minutes of embarrassment and humiliation will give you a lifetime of new knowledge. And the truth is, the 5-minutes of embarrassment is only there if you let it be. Forget it as quickly as possible for everyone else has forgotten it much quicker. You can be assured of that. Just like a boomerang, life will give back what you put out. So many complain about how others are selfish, mean, disrespectful and down right ugly. Learn to put out happiness, respect, kindness and honor. You will get it back by the bushel. The key is----don't stop. Putting out good is like a savings account, you never know when you're going to benefit from your discipline. Even though you may not know how or where you're going to spend what you're saving today, you are greatly increasing your odds at having a better future. The boomerang theory will do the same. We are taught to keep up with the Jones'. Marketing, advertising, peer pressure and vanity make all of us fight to "look" successful and happy, but not necessarily to be successful and happy. Despite the fact that most of us know that money doesn't buy happiness and enough never seems to be enough, we still get caught in the trap of "keeping up", and this venture makes us all fall short of the illusive dream. Will we ever be able to say that we have enough? Regardless of who we are or how we've been raised, the human spirit gains comfort and happiness via certain criteria that has nothing to do with materialisms. The soul needs the basics, but the basics somehow get stepped over on the trip to happiness and no one really sees them until it's too late to get back to them. So let's teach you how to turn the trip around and begin immediately to get back to what matters most in life, your happiness. All you'll ever own in life lies inside that circle. Any job, spouse, child, house, car, boat, friend, etc. is merely borrowed for some period of time. We do not control any of these "luxuries" of life and are vulnerable to lose them at any time. A spouse through divorce or death. A child through running away, drugs, death, college or marriage. A boat through theft. A car through an accident or repossession. A house through sale or repossession. You may think you have some control over these assets, and the truth is you do have some, but most people lose sight and begin to think they "own" all of them and control the destiny that lies ahead. This is where the realities of life and the hopes and dreams of life separate drastically, and this now becomes the material that causes depressions, suicides, divorces, etc. If you can believe that every gift you have is borrowed at best, two things will happen. You will work very hard to keep these gifts. Instead of a young husband out making eyes at some young girl he may work with, he will realize that the reality of losing his wife is always very high and he might better work to keep her happy. Secondly, with this approach to life, you will have a better understanding when you do lose. You will be thankful for the time you were able to borrow whatever it was and move forward with the joy and humility that is necessary to succeed in life. So, do away with the Jones' and go buy a piece of chalk. Quit taking anything for granted, as you are owed nothing and anything you now have you must continue to work hard to keep. If you lose it, don't think you're alone. The world loses everyday. Just don't quit. You'll learn and appreciate more next time. If you knew you had the remote control on everyone elses personality and decisions, you'd think you died and went to heaven. Think of all the benefits you'd quickly gain if you could control the answer of everyone you come into contact with. The job you want, the mate you want, the salary you want, all at your fingertips. Well, the truth is, it isn't quite that easy. But it's pretty darned close. Most people spend their lives "reacting" to what society happens to throw at you on any given day. If your boss is mad, you "react". If your spouse is upset, you "react". If there is a traffic jam on your way to work making you late for a very important meeting, you "react". Your days are spent "reacting" to everyone and everything. Who's doing the acting? Who's the one having it his/her way? From this point on, it's got to be YOU! Design your day, your week, your life, and follow that design. If you get yelled at, don't bail on your schedule. For example, if your boss yells and demands a better report, smile, thank them and get it done as quickly as possible. If you get into a traffic jam on your way to an important meeting, relax. You have a limited set of options at this point and it's the perfect time to "exercise" your mind by learning how to relax at a time when most would be going crazy. When you get to work, simply explain what happened and then go about your day doing what can be done from this point on. Quit acting like a meteorite is coming at your head. Regardless of all of the distractions, set your objectives. Make others realize that you are a do-er of life and that you and your schedule are important. Don't be the first to say, "I'll give up what I do to make your life better". ACT!, and the world will support you. Secondly, treat others with respect and they will "react" accordingly. Treat others with a happy demeanor, a positive personality, and you will receive the same. When someone is upset at you, simply apologize and ask them how you can avoid doing it again. What can you do to help them at this point. As soon as they see you are changing the rules of the argument (by giving kindness), they will follow. No one can be mad at someone apologizing and being kind to them. Learn to act instead of react, and your life will all of a sudden become "your" life again. Our lives are filled with problems. As soon as one ends, another begins. Sometimes on a really bad day, they even overlap. Usually we're overwhelmed with yesterday's problems and in fear of tomorrow's. The mind becomes a mud puddle of stress and it truly becomes hard to ever enjoy life. There has to become some method to be able to shield yourself from yesterday's problems, delay tomorrow's problems until tomorrow and have an up-beat and iron clad system for coping with today's problems, and then maybe, just maybe life will be fun again. Well, the shelf theory gives the brain a visual of how this can happen. Under the premises that the mind can truly only handle one problem at a time efficiently, we're going to envision many boxes on a shelf, all titled with a different problem. Each and every problem sits in a box on a shelf, much like our collection of books in our library. The key here is that the problems are not sitting in our mind, they're in the boxes on the shelf. When the time comes and you can work on a problem, pull the box off the shelf and give it 100% of you efforts. Not only will the problem be handled much more efficiently, but it will also receive the time and concentration it deserves. When you have worked as much as you want, put the problem back into the box and put the box back on the shelf. Now this may seem like a simpleton exercise, but true success is not difficult, it is only the ability to control your emotions. In order to be efficient in solving problems, you need to dedicate yourself to one problem at a time. In order to be efficient at happiness, you can't have a brain swimming in a mud puddle of problems. You're not solving any problems while at the movies, but many people can't enjoy the movie because they are constantly thinking of their problems. You can't solve your problems when you are visiting friends, but many people can't enjoy themselves while visiting friends because of "all their problems". Learn how to "put them in a box on the shelf", and you'll find that life becomes much simpler. The pace of life is so fast, we miss 80% of what we pass. We get so caught up in the problems that hit us yesterday and the problems that are coming tomorrow, we hardly have time to realize the experience we are feeling at the moment. When eating, the typical cycle of each bite goes something like this; insert fork into piece of food. Place fork in mouth. While chewing, the eyes roam the plate determining which piece of food will be the next victim. Despite the fact that the only piece of food we can really taste and enjoy at any moment in time is the one in our mouth, we still let our focus be on "the next bite", drastically reducing the joy of this bite. This becomes a habit of life and the only way to change the habit, the only way to learn to enjoy NOW is to practice. This takes years of constant effort to master this concept, but the upside of it is that you'll truly enjoy more of life and stop missing the scenery you're passing on this journey. Those who don’t run can’t understand the big fuss. “Why would anyone run?”. Those who do run protect it like a fortune. “It’s the most important thing in my life.” And those poor souls who are former runners due to injury live on a pilgrimage back to youth. Their undying hope is “maybe, just maybe...”. What is it that turns normal people into cult-like members once they learn what it’s like to finish their first 5k or do a long group run on a Saturday morning? What makes them convert into a “runner”? Life is all about motion. In fact, I’m currently reading Robert Ringer’s new book Nothing Happens Until Something Moves. Great book. Ringer deals with the very basic universal laws of life, the laws that, if adhered to, would turn this crazy world into a balanced, respectful territory. But, the key to his entire message is motion. Motion is the very essence of life--the key to happiness & the ultimate therapy for the masses. Running takes this message to a whole new level. Running is an organized, planned approach to insure that your life includes motion. It allows you to spend time with others who are important in your life. Without running, you’d hardly ever see such people. This is where everything starts getting sour on you. We have so many patients who are unable to move, with sprains, strains, arthritis and bloated schedules. I’ve come to the conclusion that lack of motion in your life is the beginning of the downhill. Think about it; weight gain, something in epidemic proportion in this country and getting worse, increased blood pressure, which should be treated with increased “motion” long before any prescription is recommended, blood sugar problems, as a result of weight gain, and most importantly, a frazzled psyche. The psychological component is without a doubt the biggest reason people get hooked on running. Running is such an appropriate therapy for all of us, as most people have very little margin in their psychological world for any types of stresses. Yet, as we’ve written about so many times in the past, expect problems, as they are a constant part of life. Running seems to reduce the size of problems, but more importantly, gives us a quiet time to think them through and come up with better answers. I’m amazed how often I leave the house with “issues”, and come home with simple solutions. I can’t imagine how much it would have cost had I asked a professional to listen to me and then tell me what to do. Not to mention the fact, their answer could never be as valuable as mine. As we get older, all of us truly recognize that mobility is so much better than immobility. I tell my geriatric patients “Keep going, as they can’t throw dirt on you as long as you’re moving”. They laugh, but they know I’m serious. When younger, we feel like we’re bullet proof, and that youth will always be there. As we begin reaching middle age, we realize, aging happens to all of us. The aging process slows down the more active you are, not to mention the fact that life just seems to be a little less chaotic if we can include motion in our daily life. I encourage all patients to increase their daily motion. If you can run, run. If you can’t run, walk. Combine the two. Jeff Galloway has done a phenomenal job of converting people into marathoners with the inclusion of walking. Die hard runners have a hard time walking during any training or racing event, but for those who wish to make it a lifetime activity, it only makes sense to do what you have to do to stay out on the road. I was going through some old magazines the other day, when I came upon an article by the George Sheehan. It was in his later years, and he was telling the story of him out running, when some young runner approached him and asked him what his pace was. Sheehan always had a way of keeping everything in perspective. His response to the young man was “comfortable”, as he claimed he no longer checked for distance and time. His joy of running was now at a different level, but one he felt was the best he’d ever experienced. Mimic Sheehan. Keep the fire burning by staying out there. Never give up, as any motion outdoors is mandatory for all of us. And, if you’re dream is anything like mine, you’ll also want to run to your funeral at the age of 105. I’ll drink to that. I was recently on a flight, and next to me sat a 40 some year old fellow. I usually avoid conversation with people who sit next to me, as I hate to sit with my head turned for long periods of time participating in conversations I’d rather not be in. “So, where you heading?”, he asks. “ I’m off to a seminar in Omaha” I tell him. His eyes light up. People love talking about themselves. He’s a tennis player, and about 2 months ago, he pulled a calf muscle. He’s been to multiple docs and therapists, and he’s still injured, and doesn’t know how to fix it, or who to go to. Well, not only do I know how to fix it, but I also know that I must be the leading authority in the country on calf pulls, not because I’m smart, but because I had an 8 year period in my life where I couldn’t run beyond 3 miles without pulling a calf. I estimate I pulled my calf muscles 60-70 times over that period. Ultimately (after figuring out the answer), I made it back to marathoning, a mere 14 years after my prior marathon. So I was intimately aware of the emotionally frustrating journey this poor guy was on. But, the clincher was this, and even he was upset over it; his primary took his blood pressure as part of the exam on his calf (I guess you always revert back to what you know), and found his blood pressure was a tad high. The guy tells me it’s high because he’s gained 15 pounds in the past 2 months since he can’t exercise. So, the primary writes a prescription for high blood pressure medication and sends him on his way. Not wanting to waste any more of my valuable word allotment for this article, I’ll assume you see the problem here. responsibility, without any effort to fix this incredibly broken system. tests, we’re referred to many specialists, and in the end, never learn how to “fix” our problem. We get a prescription to block our body’s warning signals (some call them symptoms) or ultimately have surgery to remove such a troublesome organ, gland or joint. And we ask, “Why didn’t anyone ever teach me how to keep my gall bladder healthy?”. We’re not a healthcare industry that teaches and educates, we’re a healthcare business that profits from society’s illnesses and maladies. And, reacting produces higher profits than acting. It’s called managed care. It all falls under the word “MOTION”. As in, moving. If all of us were in training for a marathon, the healthcare debt would go down. Motion, or daily exercise, keeps your weight down, your anxieties down, your blood pressure down, your cholesterol down, as well as the need to continue buying bigger clothes. All runners have learned this. But, many people will respond, “Yes, but every time I try to exercise, my hip/back/knee/or whatever goes out, and I’m injured. It’s just too frustrating. And, I don’t know how to get over that hump”. In response to that issue, I’ll once again say, it’s all about “MOTION”. But, in this case, we’re talking, motion of the joints. When you have joints that have full mobility, particularly in the spine and pelvis, there is an increased tolerance to stress, as compared to a joint that has lost mobility. As we age, we lose mobility. When we’re injured, we lose mobility. As we gain weight, we lose mobility. So, how do we keep mobility, or get back mobility in all of our joints? See your chiropractor on a regular basis. Or, your osteopath, if they will adjust you that frequently. Every American should be adjusted (have joints mobilized) head to toe at least once a week throughout their lifetime in an effort to allow their body to tolerate the stresses of motion/exercise/life in order to keep their structures as healthy as possible. This will allow people to move, which is the key. Maybe then, you won’t need to see your primary who thinks the answer is a high blood pressure prescription. 32 years ago, when just starting in practice, I contacted our local high school football coach and offered my services to his team. A couple times a week I would work on any players who asked for help. As great as the job seemed, it was short lived. As soon as the school physician got wind of my involvement, I was introduced to the politics of sports. The athletic director informed me I was not to come onto the campus again. So, my simple goal was to get back onto campus, and through the front door this time, not some side door where no one knew I was there. Along the way, I’ve learned a lot. We live with a broken sporstmedicine system, and this age group is all but ignored. Just about all healthcare decisions are based upon health insurance guidelines. Most high school athlete’s care will depend upon what their insurance covers. So, they have to be injured before they can do anything. Anyone in the healthcare delivery industry knows that health insurance coerage is shrinking at a severe rate (increased co-pays and deductibles with decreased coverage), and unfortunately, the care of high school athletes is jammed underneath this broken healthcare system umbrella. Athletes, especially middle and high school athletes, have needs that are much different and far greater than the needs of the general population. These needs are ignored. All middle and high school athletes receive a physical prior to the season beginning, but the majority of this examination is a medical exam, i.e. eyes, ears, nose and throat. Yes, these tests are needed, but the biomechanical exam, which checks the muscular, neurological and skeletal systems, is absent. The examiner will perform a scoliosis screening. (This is like saying the absence of terminal cancer means you’re healthy). As in, there’s a lot more to biomechanics than a scoliosis screening. We live in a reactive healthcare system dictated by economics. These kids are never looked at until they’re hurt. Secondly, our front line docs (primaries) are not trained in biomechanics, therefore, are not qualified to accurately diagnose or treat these injuries. The “System” then kicks into a costly referral system, going from the primary to the orthopedist to the physical therapist or chiropractor, and the treatment goal is to get rid of the pain/injury. No biomechanics involved. The New York Giants and Chicago Bulls used a conditioning pyramid, with the base of that pyramid containing 6 categories; aerobic capacity, body composition, joint mobility, strength endurance, core strength and anaerobic capacity. These professional athletes needed to pass tests in all 6 categories before they could enter the weight room. In almost every high school in this country, kids begin aggressively working out with weights with questionable supervision and absolutely no biomechanical evaluations. This egregious omission WILL produce devastating long term detrimental effects. When an athlete becomes injured, the goal is to reduce the symptoms, but never correct the underlying problem. Fig. 1 shows an example of the biomechanical imbalances that exist in all of us, and it is these imbalances that lead to the majority of injuries in athletes. These imbalances originate in the feet (our foundation), and if this imbalance is not addressed, we have a limited potential in balancing the rest of the structure. We’re sitting on a ticking time bomb. Many of these kids suffer with low level injuries that don’t meet the criteria for taking action. But, all of these kids have mild to extreme biomechanical faults, and our current sportsmedicine system prefers to perform joint replacements and prescribe a lifetime of pharmaceuticals later rather than address the issues now. Chiropractors and Physical Therapists—you’re the biomechanical providers out there, so you need to step up. The first step is to get to the schools and educate the families and coaches. Then offer your services for a complete biomechanical exam for all athletes, not just those injured. This should take place before the season begins. A biomechanical exam can be found at www.StructuralManagement.com. 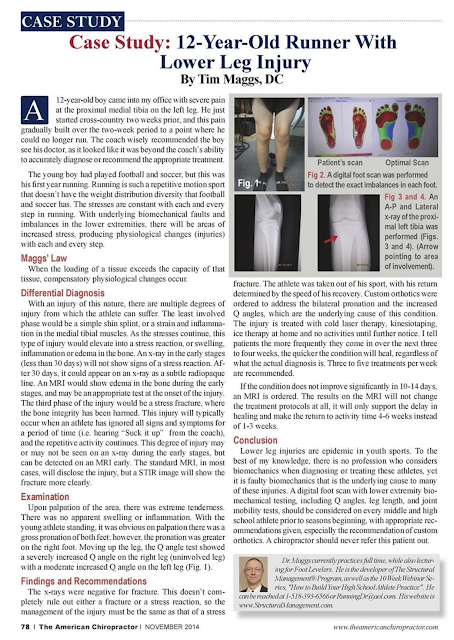 Prescribe flexible custom orthotics as a first step in balancing their biomechanics. Family Drs.—admit this isn’t your specialty, and work with the families to find a chiropractor or physical therapist who will help with the biomechanical needs of the athlete. Athletic Directors—realize you are the lynchpin to all parents and athletes in your school district. Your role is critical. Work with those who are capable of providing more biomechanical information to this group. Don’t settle for that age old response, “We’ve done fine without this so why do we need it now”. Coaches—you’re the ones who have the most contact with these athletes. Teach them about prevention and the importance of being disciplined in taking care of themselves. Help to build the bridge between families and biomechanical providers in your communities. Small injuries are warning signals. Please don’t promote the “No Pain, No Gain” mantra. Realize that pain is a warning signal for underlying biomechanical imbalances. Parents—don’t stop until you find someone who will perform a biomechanical exam on your child. It will help detect the predictable sights of injuries, and will uncover the reasons why chronic injuries persist. And, encourage corrective recommendations. Other than that, have a great month.